Water rarely gets a bad rap. It helps keep vital organs functioning, and when our hair just isn’t working, that added moisture makes it easier to style. And if you’re growing out a very short haircut like me, wetting your hair every day almost feels necessary. But that daily process also takes time, and according to Britta Cox, founder of the innovative hair-drying system Aquis, it could be doing more harm than good. While too much heat on the hair can cause irreversible damage, dousing it in water isn’t any better. Ahead, we debunk the biggest myths about how our hair interacts with water and finally separate fact from fiction… just in time for a new season. Although getting your hair wet can help your curls re-form and take shape, the by-product will almost always be frizz. “Think of when you go out when it’s raining, and you just spent all this time on your hair in the morning. You’d protect your hair from the rain because it causes frizz, right? 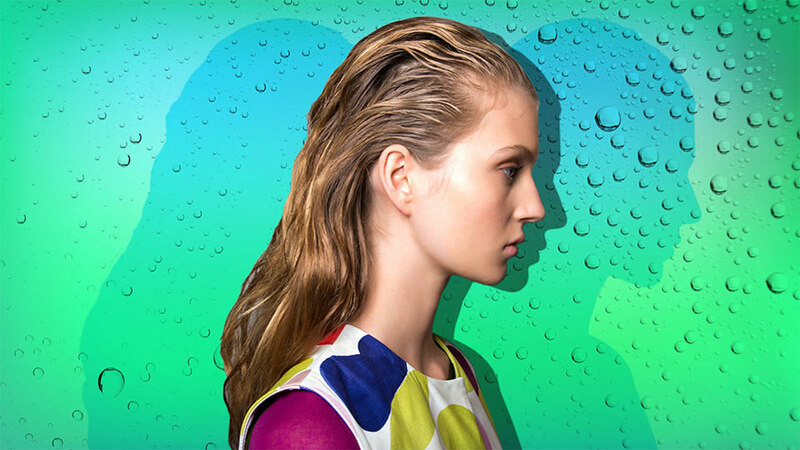 Spraying water onto your hair can help the curls re-coil, but also will cause that same frizz rain will,” says Cox. To harness the benefits of wet curls, try a resetting spray instead. This will give them spiral and bounce but also protect them from the side effects of water. Most of us will walk out the door with wet hair to avoid the blow-drying and flat-ironing that leads to heat damage. But according to Cox, leaving hair soaking wet isn’t good for it either. “Think about your nails after you come out of a bath. They look and feel soft and weak — not strong and healthy as they do when they are dry. This same thing happens to your hair after long exposure to water (your hair and your nails are both made of keratin),” she says. The fancy word for this chemical change is called hygral fatigue, which is better known as water fatigue. Putting your hair through this on a daily basis weakens the hair strands, leading to breakage, frizz and all of the other signs of damage we’ve grown accustomed to. So don’t do it! Hard water, or water that has a high mineral content, can absolutely negatively impact your hair. So what separates “hard” water from the regular kind? Think of it like this: a water molecule is made of two hydrogen atoms and one oxygen atom. But when water molecules percolate through limestone (i.e., pipes), they can pick up extra minerals, such as calcium and magnesium deposits, that can not only show up on your shower head but get into your hair too. There’s no clear-cut answer to this. While leaving hair wet can result in a lot of damage, so can blow-drying it. Although a diffuser attachment won’t completely reverse the damage, it’ll certainly ease the distribution of heat onto your strands. Experts routinely say that the hair’s ability (or lack thereof) to retain moisture largely determines the way we should treat it, thus maximizing the benefits of our go-to products. The most popular way to determine where our hair falls on the porosity scale involves cutting a small strand from our head and dropping it into a glass of water. If the strand floats after three to four minutes, you categorize as low porosity. If it sinks, consider your hair high porosity. Cox says that the accuracy of this test is generally true, “but if your hair is covered with oil or sebum, it will likely float, even if it is porous,” so this test isn’t the end-all, be-all. Washing the hair with hot water actually accelerates the water fatigue process we talked about before. “However, once the hair is fatigued, rinsing it with cold water doesn’t make the cuticles close any faster. Cold water is great for your lymphatic system and skin, but doesn’t do anything for your hair,” says Cox. Her best advice would be not to wash — or rinse — your hair with scalding-hot water. Instead, be gentle on it, like you would your skin. Although water is essential to the body, drinking more of it won’t have a direct effect on hair growth. What matters more is how water is topically applied to the strands. “Water is great for your skin, though, and as your scalp is skin, water is probably good for your scalp health,” says Cox. While steam may be an effective detoxifying method for hair, it actually has the opposite effect on hair strands, damaging them from the inside out. “When it comes in contact with water (including in the steam form), the inside core of your hair strand swells and bloats, pushing open the protective layers (called cuticles). Cuticles just aren’t meant to open and close that often. They’re not hinges. Broken cuticles are hair breakage. Open cuticles are frizz. Cuticles catching onto each other are tangles. Healthy hair is basically healthy, flat-lying cuticles,” says Cox. Although satin is cheaper and more accessible, silk is actually the best fabric for hair since it’s gentler. While the latter can give you a similar slippery feeling, it’s usually blended with rougher polyester. At the same time, neither silk nor satin is exactly ideal for drying sopping wet hair. The next best thing would be a microfiber towel, which tends to dry hair faster than a cotton towel. But since they are also designed with an electromagnetic charge to catch dirt and moisture, that same charge also catches onto vulnerable wet strands, causing breakage, frizz and tangles. If you need a happy medium, Cox recommends her Aquis towel. It dries with the speed of a traditional microfiber one but is made with a unique patented technology similar to workout gear that gently wicks away moisture.